The Plinkster Pro kit is back! This v2 version of our famous Plinkster Pro kit upgraded with both a more consistent and and accurate rifle and a far superior target. The gun itself features a wood stock and shoots and just under the legal limit of 12ft/lb making it accurate to ranges just over 40m. The gun comes complete with 4x32 scope or iron sights for which ever you prefer. The gun comes complete with ProShot resetting target to help you practice your aim. 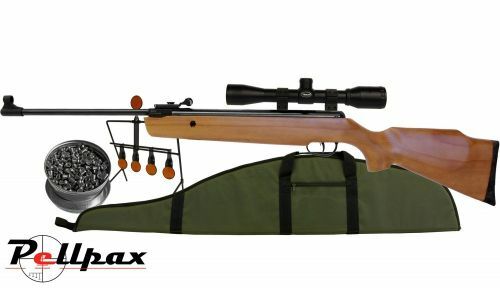 The kit contains a padded gunbag to protect your rifle and scope and also a tin of pellets that are perfect all rounders for targets or pests.